Join editors Yiannis Colakides, Marc Garrett, Inte Gloerich, contributors Max Dovey and Helen Kaplinsky, and respondent Ruth Catlow for short presentations with plenty for time for discussion. *Please note that this is a separate building to the Furtherfield Gallery and is located close to the Finsbury Park station entrance to the Park. This publication investigates the new relationships between states, citizens and the stateless made possible by emerging technologies. Focusing on how such technologies impact identity and citizenship, digital labour and finance, the project joins five experienced partners Aksioma (SI), Drugo More (HR), Furtherfield (UK), Institute of Network Cultures (NL), and NeMe (CY) together with a range of artists, curators, theorists and audiences. 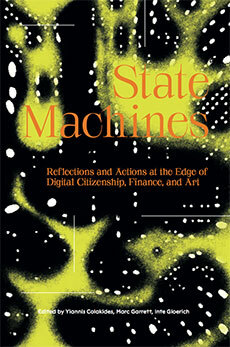 State Machines insists on the need for new forms of expression and new artistic practices to address the most urgent questions of our time, and seeks to educate and empower the digital subjects of today to become active, engaged, and effective digital citizens of tomorrow.